AIR ENVIRONMENTAL MONITORING 62 unmanned systems inside August/September 2017 On the storied shores of California's Salton Sea, Juniper Unmanned has used a DJI Matrice 600 Pro equipped with YellowScan's Surveyor LiDAR scanner to assess the condition of tillage aimed at reducing perilous airborne dust. by Peter Gutierrez Photos courtesy of NASA, GregManninLB and Peter Gutierrez. 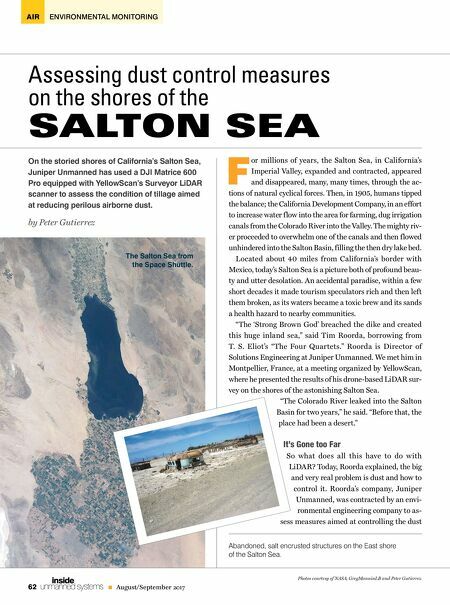 F or millions of years, the Salton Sea, in California's Imperial Valley, expanded and contracted, appeared and disappeared, many, many times, through the ac- tions of natural cyclical forces. Then, in 1905, humans tipped the balance; the California Development Company, in an effort to increase water flow into the area for farming, dug irrigation canals from the Colorado River into the Valley. The mighty riv- er proceeded to overwhelm one of the canals and then flowed unhindered into the Salton Basin, filling the then dry lake bed. Located about 40 miles from California's border with Mexico, today's Salton Sea is a picture both of profound beau- ty and utter desolation. An accidental paradise, within a few short decades it made tourism speculators rich and then left them broken, as its waters became a toxic brew and its sands a health hazard to nearby communities. "The 'Strong Brown God' breached the dike and created this huge inland sea," said Tim Roorda, borrowing from T. S. Eliot's "The Four Quartets." Roorda is Director of Solutions Engineering at Juniper Unmanned. We met him in Montpellier, France, at a meeting organized by YellowScan, where he presented the results of his drone-based LiDAR sur- vey on the shores of the astonishing Salton Sea. "The Colorado River leaked into the Salton Basin for two years," he said. "Before that, the place had been a desert." It's Gone too Far So what does all this have to do with LiDAR? Today, Roorda explained, the big and very real problem is dust and how to control it. 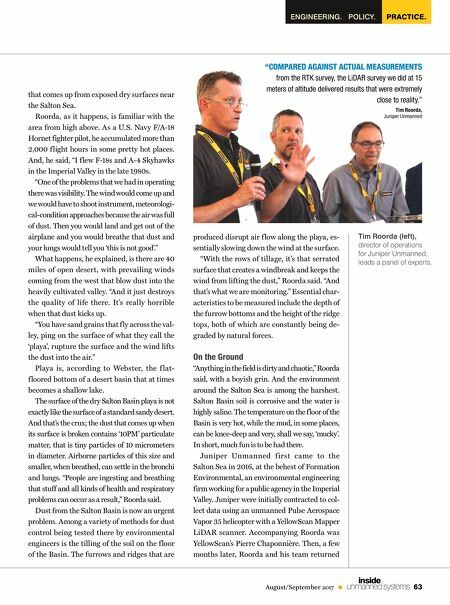 Roorda's company, Juniper Unmanned, was contracted by an envi- ronmental engineering company to as- sess measures aimed at controlling the dust Assessing dust control measures on the shores of the SALTON SEA The Salton Sea from the Space Shuttle. Abandoned, salt encrusted structures on the East shore of the Salton Sea.